a) Ph.D. or Master's Degree in Veterinary Public Health/ Microbiology/ Parasitology/ Epidemiology/ Biotechnology OR M.Sc./ M.Tech. in Microbiology/ Biotechnology with at least 3 years research experience and 2 research paper in Science citation indexed (SCI) journal. b) Knowledge of Computer Applications. a)Higher Secondary in Science Stream with Two (02) years diploma in Medical Laboratory Technician. b) Certificate of Computer Applications. How to apply: Candidates are requested to bring all the relevant documents in original and one set of photocopies of the same along with CV. Interview Date / Time: 11-02-2019 from 10 AM onwards. 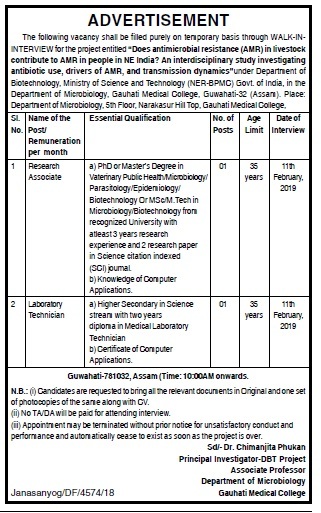 Venue: Department of Microbiology, 5th Floor, Narakasur Hill Top, Gauhati Medical College, Guwahati-781032, Assam.